Monday marked the beginning of academic week #2 on the applied theatre course. Students and staff had a chance to rest on Sunday, and students submitted their first academic journals to their tutors on Monday morning. We made our fourth site visit of the course to Dalkey Castle and Heritage Centre. We’ve included this site on the course since 2004, and we’re always greeted with hospitality and enthusiasm by Margaret Dunne, the manager of the centre. Dalkey has a reputation as being a very wealthy suburb of Dublin. It’s been described to me as the equivalent of Beverly Hills. Several Irish artists of international fame make their homes there including Maeve Binchy, Bono, the Edge, Van Morrison, Enya, and Neil Jordan. Dalkey also has a great literary tradition, including serving as the location for chapter two of Joyce’s Ulysses. Dalkey Castle is largely intact, and when Margaret took over as the manager of the heritage centre attached to the castle, she recognized the rich history of the castle and the town itself. Margaret talked with the group about identifying what already exists in a place where one is working. What are the raw materials? What can the artist-manager build from? In Margaret’s case, her background in theatre played a major role in how she moved forward with the centre. She successfully created the Deilg Inis Living History Theatre Company, a professional company of actors charged with animating the historical sites at the centre, which include the castle and a church to St. Begnet, the patron saint of Dalkey. We had a great experience with the actors on our tour of the sites, and it was exciting to see how theatre could be used to truly engaging an audience in the detailed history of a location. The actors engaged with us at a very high level, and I appreciated their ability to pitch their performances and their improvised interactions to a group of adults. 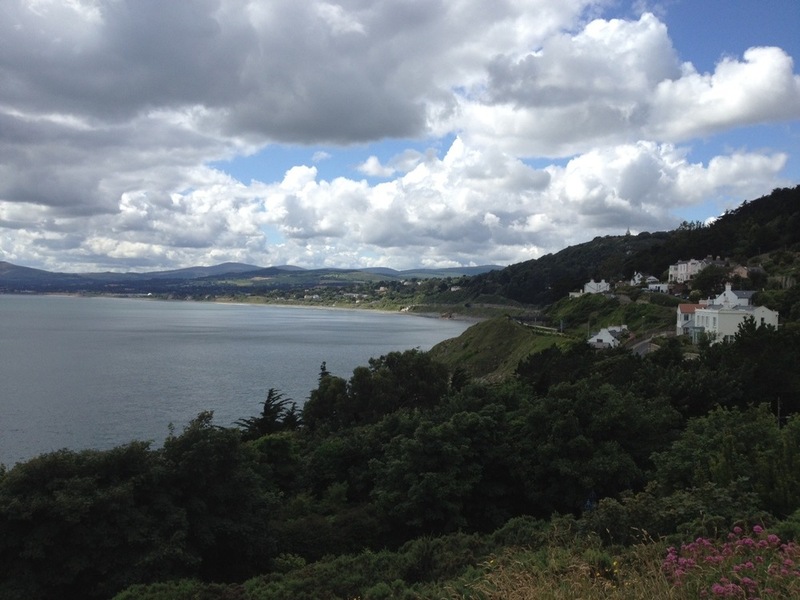 We then had a tour of the town of Dalkey, including some of the beautiful homes and views of Dalkey Island. Once again, Margaret Dunne and Dalkey did not disappoint, as I heard several positive comments from students about how inspiring it was to meet Margaret and engage with all of the great programming she has created at the heritage site. Students then spent their first session in the devising process with Jenny Macdonald and Declan Gorman. Over the course of six working sessions, students will now create two original works with Jenny and Declan, as a way to explore methodologies that can be used in community-engaged theatre creation processes. More details will emerge over the coming days, and I’m hoping to sneak in and see what’s happening in each of these rehearsals. We ended the day with a performance of O’Casey’s The Plough and the Stars presented by the Abbey Theatre in a production directed by Wayne Jordan. This production is a remount from two summers ago that will eventually go on tour, so I had seen it back when I was here in 2010. It is an Irish classic, exploring the experiences of men and women living in a Dublin tenement leading up to and during the Easter Rising of April 1916. At three hours, the play is long, but the work of the actors and the production team kept me fully engaged from start to finish. I had mentally prepared myself for a bit of a struggle, as I thought that my focus might wander a bit since I had seen it before. Not the case, as I found myself fully immersed in the world of the play via the excellent acting, the innovative staging, and the design elements. We saw the show in previews, so I sensed a few tempo issues that are still coming into alignment. However, those moments didn’t detract from my overall experience of the story. O’Casey’s play has an epic feel, and his characters are quite Shakespearean in their plights and their verbal expression of their feelings. The production locates the comedy interspersed with all of the pathos of a play about suffering during a revolution, and I was appreciative of this reality that Wayne Jordan achieves through his direction of the play. It’s a beautiful and painful production that left me with questions about history, choice, love, dedication, devotion. What’s the difference between dedication and devotion? Seems like Jack and Nora wrestle with that question whenever they’re on stage together. And their wrestling, particularly in the first act, is quite memorable. Both of the above experiences allow audiences to invest in the details of specific human experiences at important historical moments in the history of Ireland. Margaret Dunne expressed an importance in staying as true to possible to the facts of a given situation, whereas O’Casey clearly created a fictional group of people living in a fictional tenement at the time of an actual event in an actual city. While somewhat different in their approaches, both experiences are unified in their unique way of exploring history through theatre. See below for images from the trip to Dalkey.